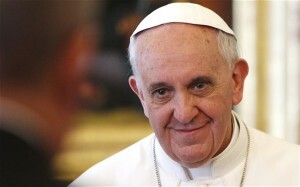 Home » Does Pope Francis Really Hate California’s Cap-And-Trade Program? Does Pope Francis Really Hate California’s Cap-And-Trade Program? I have been a critic of cap-and-trade in the past, particularly the federal version proposed in 2009. The evidence to date for cap-and-trade at that point wasn’t great, with failed programs in Southern California and the European Union and a seeming success in the Northeast that had more to do with a technological fix than program design. But I’ve been impressed with California’s efforts to implement it so far. First, the California Air Resources Board developed strong and thoughtful rules that have apparently worked to forestall market manipulation and garner real results in terms of emissions reductions. Second, cap-and-trade has been an important backstop for other state climate policies, such as for renewable energy, low-carbon fuel, and energy efficiency. And third, the allowance auctions have generated a lot of revenue (possibly $4 billion this year) that will be used in significant amounts for pollution reduction in low-income communities, including for weatherization and affordable housing. So why is the Pope being so negative? My guess is that his criticism is more about the European cap-and-trade system, which did not work as planned and resulted in windfall profits for some sectors, particularly electric utilities. Perhaps if the Pope were to look more closely at California’s program, he would come away with a better feeling about it. And in any event, California’s climate efforts involve much more than cap-and-trade. But to be sure, the program provides a critical safety net to ensure the state meets its 2020 greenhouse gas targets. It may not be as elegant as a carbon tax or as forceful as command-and-control regulations, but it will get the job done. And that should be worth some papal love. I am trying to promote cap & trade in my country Argentina. Can anybody send me some information and statistics about cap & trade in California? Maybe also in some developing countries? Since California’s High-Speed Rail Project will perpetually skim 25% of all the state’s cap & trade revenue and will actually contribute (through intensive construction activities) increased GHGs until well after 2020, thereby working against the state’s GHG reduction goals, the effectiveness of the entire C&T program has been undermined. While this may have been a good solution for the boosters of HSR, who otherwise lacked most of the funding to construct the HSR project, it is not a good tool to help combat climate change, at least not until the HSR project is (eventually) fully operational (and even then, the GHG reducing benefits appear to be exaggerated). Consider the trade-offs: What other near-term GHG reducing projects could be funded with this 25%? Instead of funding projects that could actually make a real difference in the near term, ARB has acquiesced to the will of the politically powerful to keep a project of uncertain or even doubtful benefits on a very expensive form of life support. The global warming impacts of methane are still being downplayed by the CARB, which impacts a number of cap and trade-related programs that have been approved and are being considered. unless this changes, the Pope’s critique will retain merit.